How often is it that we plan or intend to start or finalize something, but we do not move into the right direction. How often is it that something gets in between that holds us back? How often is it that we allow to let something come up that won’t let us start? How often is it that we postpone and postpone things even though they are important to us? Sounds familiar? Well, I do know that I am not the only one out there who is good in procrastination! And I often wonder why that is. Don’t we all have a “feel good” sensation and get excited once we started something new. Or when we finally accomplished something that was on the list a long time already? So shouldn’t we try to embrace this feeling more often? Last week I restarted my jogging and I finally got this block out here. Both makes me happy and gives me some satisfaction. What is on your list that you keep on pushing away? 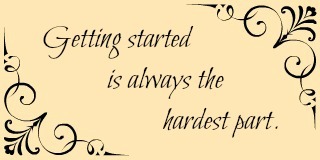 Why not join me and take your first step today on starting or finalizing something? Don’t push it back any longer, get it done – you know you will feel good after!